Data released by comScore, reveals that Facebook has outdone Microsoft, AOL and Yahoo! to become the top display advertisement publisher in the first quarter of 2010. Facebook has, for the first time, overtaken Yahoo! and Microsoft in delivering display ads in the U.S. They served 176.3 billion display ads on their website in the first quarter of this year, which accounts for 16.2% of the total display ad impressions delivered to U.S. home, work and university locations. The world’s largest social network, Facebook, has grown by 52% between the last quarter of 2009 and the first quarter of 2010. During the last quarter of 2009 they showed 115 billion ads, compared to the current 176.3 billion. Yahoo! on the other hand, has actually dropped from serving 140 billion ad impressions to 132 billion during the same period. Microsoft served 60.2 billion impressions in Q1 2010. While the numbers indicate that Facebook is now far ahead of Yahoo! 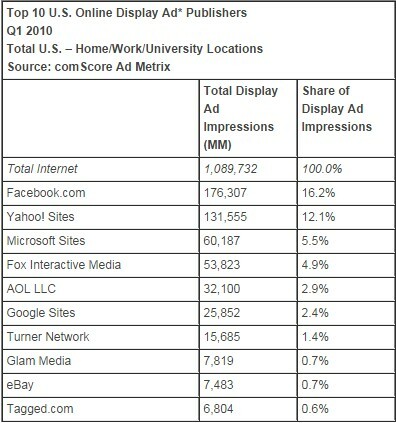 and Microsoft in serving display ads, the figures do not take into consideration the number of ads that Yahoo! and Microsoft display on other websites, which accounts for a large portion of the revenue they generate through advertising. Also, display ads counted here only include static and rich media ads. The numbers exclude video ads, house ads and very small ads less than 2,500 square pixels in dimension. Moreover, while Facebook may have the volumes, the actual revenues earned by Yahoo! and Microsoft through advertising on their Web properties are much higher. Last year, Facebook generated $ 500 million from advertising and expects to earn $1 billion this year. In contrast, Yahoo! earned $6.5 billion last year and Microsoft earned $3 billion. In spite of being far behind in terms of revenue generated, Facebook’s growth is worth noting, as the number of people on Facebook continues to grow and users continue to spend more and more time on the social network. It will most likely be just a matter of time before they establish a more effective way to monetise all this traffic. Brands such as Verizon, Toyota and Ford were among the top advertisers on Facebook this year, but were nowhere on the list of top 25 advertisers on Facebook last year. This indicates that Facebook is becoming an important platform for advertising, and marketers are probably diverting their ad spend from other sites towards Facebook. Reports from Nielsen corroborate Facebook’s growth in display advertising – they found that Facebook’s share in the U.S. display advertising market grew from 2% in April 2009 to 20% in April 2010. However, according to Nielsen, Yahoo! is still the U.S. display market leader with 34% share of the market in April 2010.